The beaches are undoubtedly one of San Diego’s biggest draws. But as it turns out, you can enjoy a waterside getaway without having to deal with sand in your shorts: come to The Pool House! 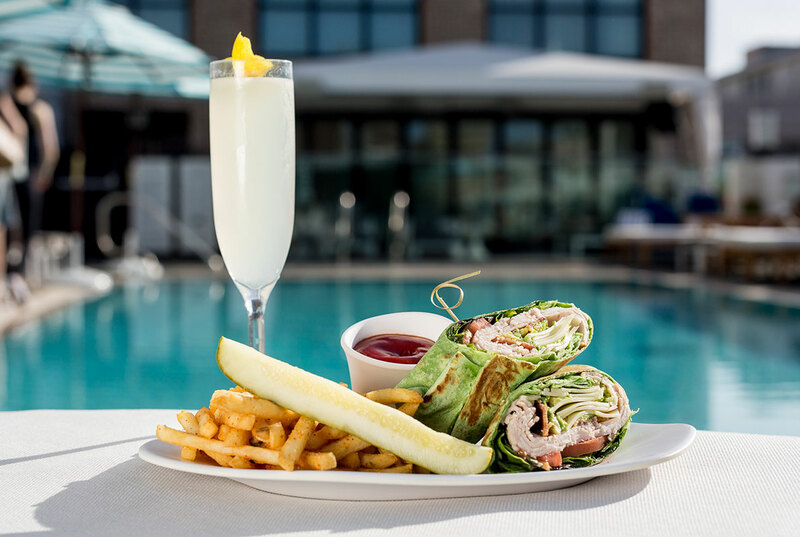 The Pool House is an elegant getaway right in the center of the action of the Gaslamp Quarter, featuring a beautiful rooftop pool, incredible food and drink, and awesome ambiance. Here, we’ll offer up some of the reasons why The Pool House is the best place to relax in San Diego! Why spend time at sea level when you can enjoy the city from great heights? The Pool House is located on a rooftop setting atop the elegant Pendry San Diego boutique hotel. This means that you can enjoy some of the best views of the city while relaxing poolside. During the day, the dazzling sunshine and blue skies make for gorgeous city vistas; as the light fades, you’ll see the sunset and city lights illuminate the sky. It doesn’t get much better than this! Scoring a great cocktail on the beach isn’t so easy. But it’s a snap at The Pool House, where we have an extensive and creative cocktail menu full of delicious concoctions like Refreshers, Mules, Margaritas, Mojitos, and Frozen Drinks. Instead of actually dealing with actual wet sand, maybe you’ll order up our Wet Sand cocktail, which is made with Malibu Black Coconut Rum, pina colada puree, and pineapple juice. Or maybe you’ll opt for one of the many other cocktails, a bottle or glass from our impressive wine menu, or a satisfying cold beer. Forget unhealthy concessions like you’ll find at the beach. 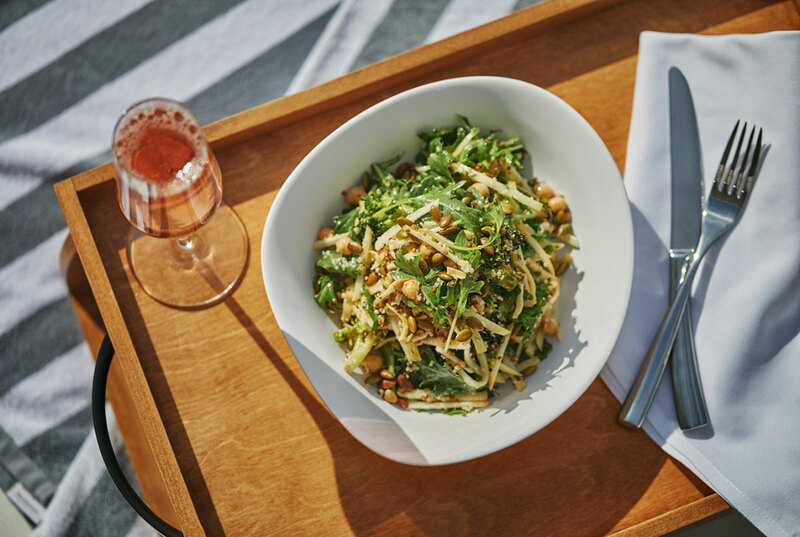 At The Pool House, we offer up an acclaimed gourmet menu full of delicious and healthy choices that are perfect for your San Diego lifestyle. Apple & Quinoa Salad, made with crisp slices of apple and quinoa are augmented with chickpeas, gouda, and roasted pumpkin seeds for a memorable salad experience. Or maybe you’ll opt for our Kale Caesar Salad, prepared with an addictive lemon pepper dressing, parmesan, and sourdough croutons. It’s refreshing and creamy all at once. We also have sandwiches, small plates, and plenty of other delectable choices! At The Pool House, there’s no need to sit on a sandy towel or struggle with setting up a jumbo umbrella. You can simply traipse on in and enjoy your own private cabana or daybed! At The Pool House, we offer a unique and luxuriant daybed and cabana service, wherein you can reserve the perfect poolside hangout in advance. It’s the perfect way to ensure that you score a great spot at our lively hangout and that you can enjoy the day in comfort. You can find out more about this service and how to make a reservation here. Dealing with cleaning up after a beach day is enough to deter you from the entire endeavor. Getting sand in your car, shaking off towels, and packing up your picnic can get tiresome. At The Pool House, you won’t have to deal with all the hassle and messy cleanup. You can simply arrive looking pretty, get pampered with drinks, food, and poolside perfection, then when you’re ready to go home, you can grab your bags and go. No hassle, no fuss, and you can maintain your relaxed state of mind. The beach can provide a tranquil escape. However, sometimes you’re looking for something a little bit more lively. At The Pool House, we’re centrally located right in the vibrant Gaslamp Quarter. 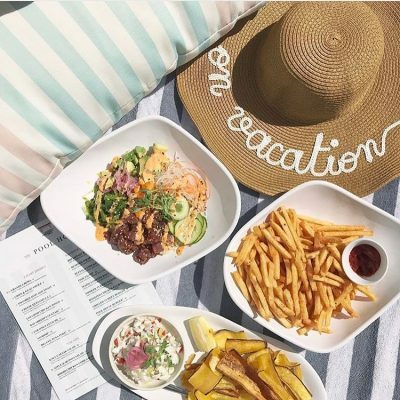 This means that when you’ve completed your fun in the sun, there are plenty of amazing destinations right outside our door, including world class cuisine at Lionfish Modern Coastal Cuisine, a San Diego nightlife experience unlike any other at nearby Oxford Social Club, and so much more. The beaches of San Diego are legendary with good reason. However, if you want to enjoy a more pampering and luxuriant experience, consider The Pool House! We have all of the elements of a great getaway by the water with a location that can’t be beat.